If you’re looking for a way to restrict your content from visitors, I have the perfect plugin for you: Restrict Content Pro. 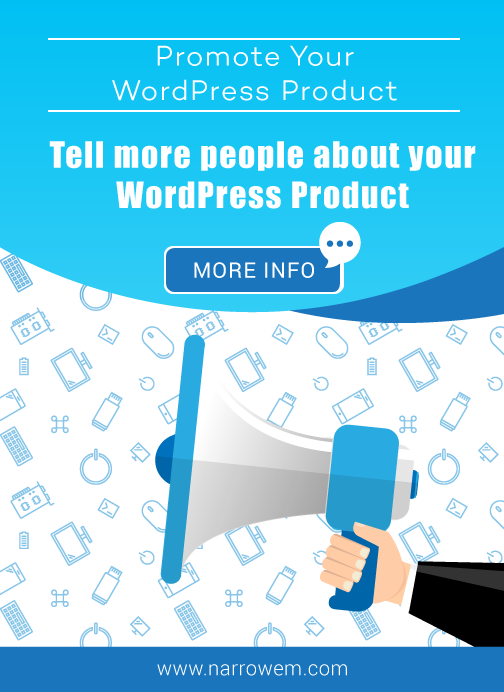 Powerful WordPress plugin that will do all the work and allow you to make a living by writing on your personal website. Different people use WordPress for different reasons but all have one thing in common: They all try to make money. Some sell physical goods online, others create eBooks or sell their art. People are keen on giving money for clothes, gadgets, all kinds of physical objects but feel really uncomfortable for paying for stuff that can’t be touched. The case is even worse if you’re a writer and you’re trying to make a living. 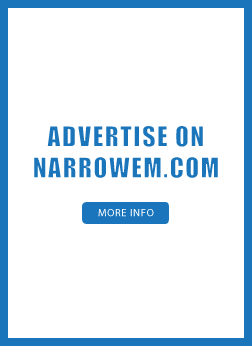 I monetize narrowem.com by writing sponsored WordPress plugins and themes reviews. Also, by adding affiliate links on my posts for the services I recommend. I ain’t gonna lie. There is a slight chance that I will get some cash if you decide to purchase a product featured on this post. But how can someone who writes stories earn a buck? If you write fiction, you might probably write a book but that takes ages. What are you going to eat during the time of writing the book? There are a lot of bloggers who write amazing pieces of content regularly. 99% of these guys do it for free. They write in their spare time. Most of them do it for fun but also hope that one day this hobby will become their main income stream. From my own personal experience, I know that writing takes time. Good writing takes even longer. You need to come up with a story, find resources, curate, write a draft, find images and etc. If you did you job well you will earn few shares on social media and probably a couple of subscribers. But this ain’t gonna pay the rent. Surely, you can add a donation button. But who does that anyway? There is a solution guys. It’s called Restrict Content Pro. This is a full-featured, powerful membership solution for WordPress. With a push of a couple of buttons, you can make your regular visitors become your clients and finally make your dream come true. In short, this plugin will hide the content from people who aren’t subscribed to your site. There are two main reasons why Restrict Content Pro is the best WordPress restrict content plugin out there: First, it’s super easy to use. Secondly, which is actually the main reason, it allows you to charge people for reading your content. How cool is that? Who Is This Plugin For? And Is It For You? If you’re a writer, content creator of any kind, you need to consider adding this plugin to your site. It’s a great solution for people who write all kinds of article that brings value to the reader. It’s especially good for people who create courses. 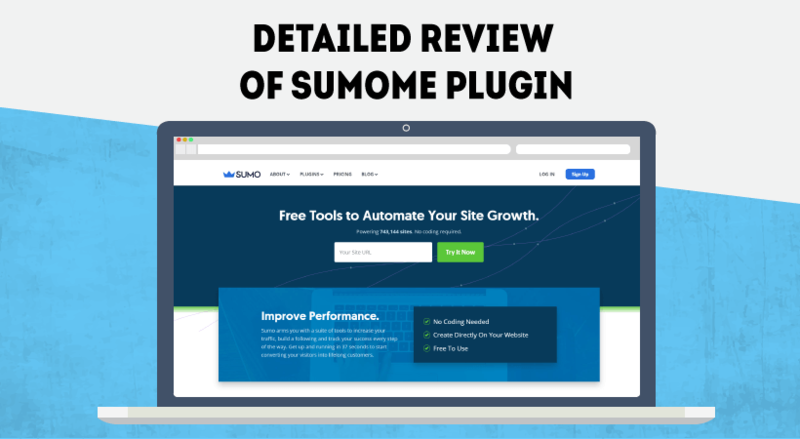 So, if you’re looking for a way to monetize you’re writing or gain more subscribers this plugin is for you. Ok, we’re done with the installation. Let’s see how we can restrict our content. Name: The name of your campaign. This will be visible for your visitors. Description: What are your subscribers going to get once they subscribe. Access Level: This is for your personal Management. For example, if you have 3 different levels of subsribtion, you will set the levels later. Duration: For how long people will have access to this content. Free Trial Duration: You can allow people to test your site. Price: What will be the price? Signup Fee: You can add a discount for the first billing cycle. Status: You can disable enable plans from here. User Role: The last step will be the level of access. This here is the foundation of your plans. Basically, the name and the description will be what sells your packages. I will add two levels of subscription: Basic and Pro. Ok, you’ve created your plans. Now, we need to create a page where people can actually subscribe to these plans. Option to choose between the plans you’ve just added, the amount and the registration button. We’re missing the payment option but we’re going add one next. Let’s talk business already. How can we earn money? You will see a bunch of payment options here. Cool. Now people can pay for your content. How to Restrict Content Using Restrict Content Pro Plugin? Ok, we have a landing page, we added a payment vendor but we now need to give something to people once they subscribe, right? Let say you have around 50 blog posts and 10 of this posts include video tutorials. You can set the video posts to be unlocked only when a visitor purchases the pro plan – at least that’s the name of this plan in this guide. The rest of the posts you can make accessible for the basic one. How to do that. 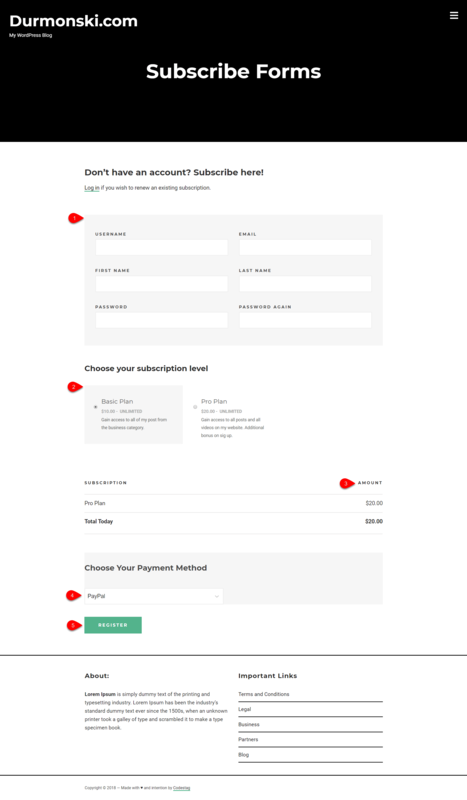 “Members of subscription level” section have 3 options. The last one is related to the one we added previously. Select which subscription plan will have access to this post. You can also add a teaser, more about that later. The last is “members with a certain role”, which is pretty self-explanatory. I’m going to hide this content for people who purchased my Basic Plan and save this. Now the post is showing only an excerpt of my post and a default message: “This content is restricted to subscribers.” But this message is not enough. I want people to have the option to learn more about my plans and actually give them more reasons to join me. Fortunately, the guys Pippinsplugins thought of that. Cool, right? This is the text we just added. Now people can click on the button and pay you money to read the post. Of course, if they think that the content is valuable for them. But what happens when someone joins your site? Add your logo, company name and etc. An easy way to gain more subscribers to your list is by applying discounts. Restrict content pro comes with a ready solution. Inside Restrict, you will see Discount Codes section where you can apply certain promotions for a specific period. Go to the Discount Codes section so I can show you. So, let say you’re a visitor and you purchase a subscription to the website. You will probably want some kind of email notification send to your address. Of course, who doesn’t another email inside his box? No seriously. Mr. Pippin created simple email notifications that will keep your users up to date with what is happening with their accounts. Save the changes when you’re done and test this setting. The goodies don’t end here. You can connect this WordPress membership plugin with some additional plugins to additionally boost your productivity. Still, even the free add-ons will do the work. The MailChimp integration is something you definitely need. This will allow you to easily add subscribers when people join your plans. What Is The Price Of Restrict Content Pro? The prices are quite reasonable considering the available functions. Keep in mind that this is subscription. Once you purchase the plugin, you will need to renew it every year to have access to updates. Beautiful integration with almost all themes. Teaser box to gain more paying customers. Additional add-ons that boost the functionality. Simple system to manage your subscribers. The fact that is subscription based is not so cool. You might need to play with the CSS for some WordPress themes. If you don’t know how to do that, you can choose a theme that is fully compatible with the plugin. 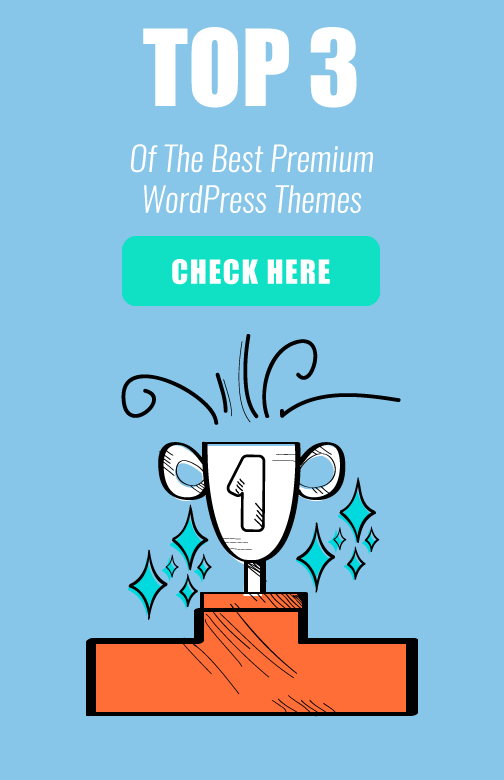 I can recommend Ink WordPress Theme. The plugin is awesome. I mean, it has everything you ever wanted: seamless installation and implementation process, automated emails, full control over your subscribers. 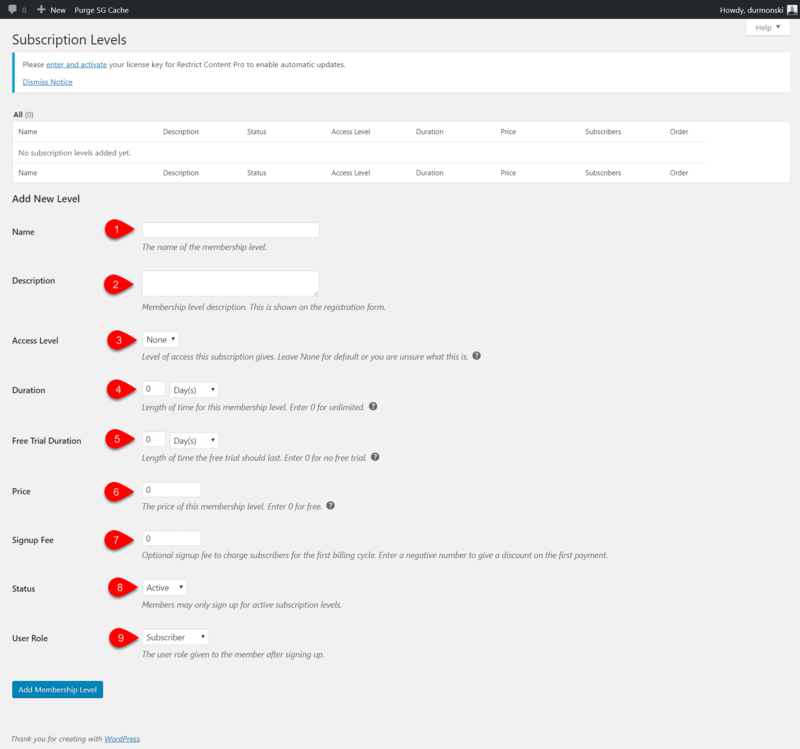 Restrict content Pro is definitely the best WordPress membership plugin. If you check the portfolio of the developers you will see that these guys have also created Easy Digital Downloads and AffiliateWP. Plugins that are downloaded by more than 100,000 times. What I want to say is that you can trust these guys. So, if you’re looking for a way to earn some cash from the content of your site, you should definitely consider adding Restrict Content Pro to your website. Yes, it will cost you nearly a hundred dollars a year, or more if you go with some of the other options, but the investment is worth it. What WordPress membership do you use? Have you ever tried some of the Pipping plugins? 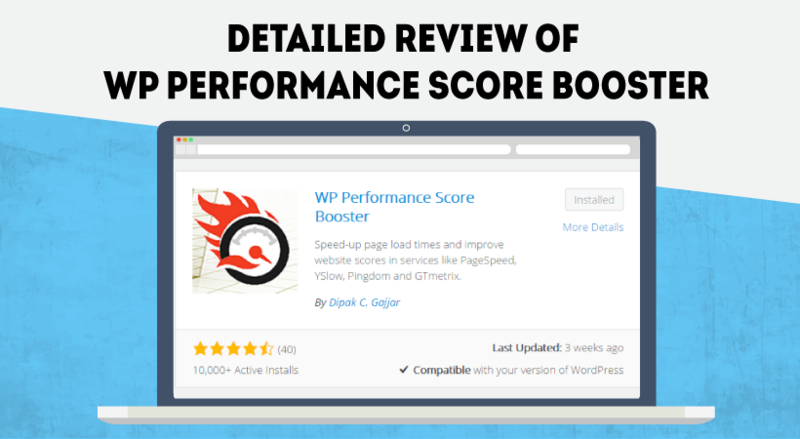 next post: Detailed Elementor Page Builder Review – Is This Really The Ultimate Page Builder?